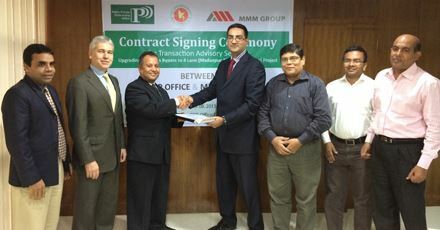 On December 8, 2013, the Public Private Partnership (PPP) Office under the Prime Minister's Office awarded a Technical Advisory services contract to MMM Group Limited, for upgrading approximately 50Km long Joydevpur-Debogram-Bhulta-Madanpur (Dhaka By-Pass) Road under a PPP modality. The services will be carried out in two phases, in the first phase the Consultant will prepare a project definition study including techno-economic and financial feasibility, and social and environmental impact assessment. A successful assessment of the first phase will lead to procuring a concessionaire to undertake the design, construction, and financing of the new highway, and maintenance and operation over the term of the concession. The Roads and Highways Department (RHD) will be the Executing Agency of the project with PPP policy and implementation support coming from the PPP Office together with the PPP unit at the Ministry of Finance. 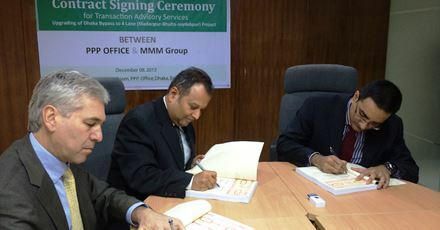 Upgrading of Dhaka By-Pass connecting Highway N4 in the north, which provides road transport network to the industrial belt north of Dhaka and also to Bhutan and Nepal as part of the South Asian Sub-Regional Economic Cooperation (SASEC) road connectivity program, with N1 in the south to Dhaka-Chittagong road is very important to reduce the present constrain of movement of goods and people between North and South of Dhaka. It will also connect Highways N2 and N3. The completion of this project will provide safe and faster travel option for the users.